Our specialist operators will take the stress and danger out of installing your steel beams with the Hooka mini tracked crawler crane. 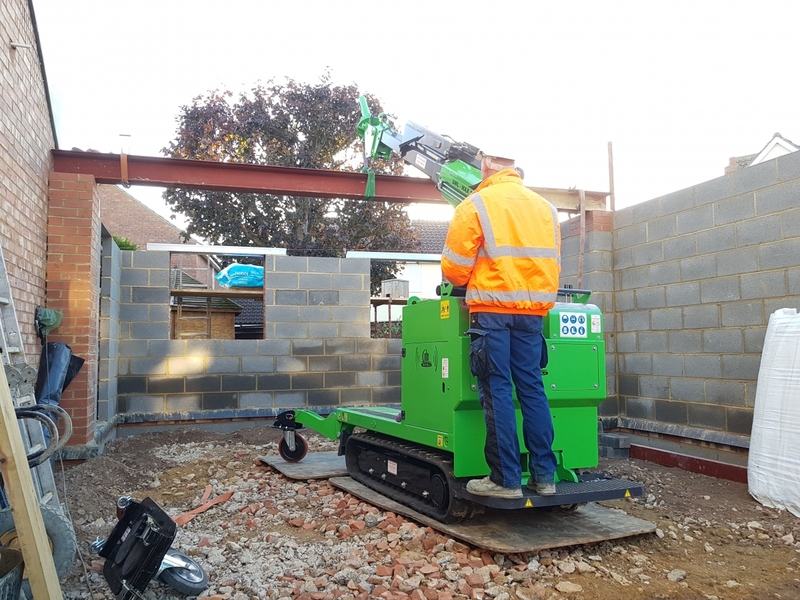 Key facts for safer Steel Beam Installations with the Hooka mini tracked crawler crane. 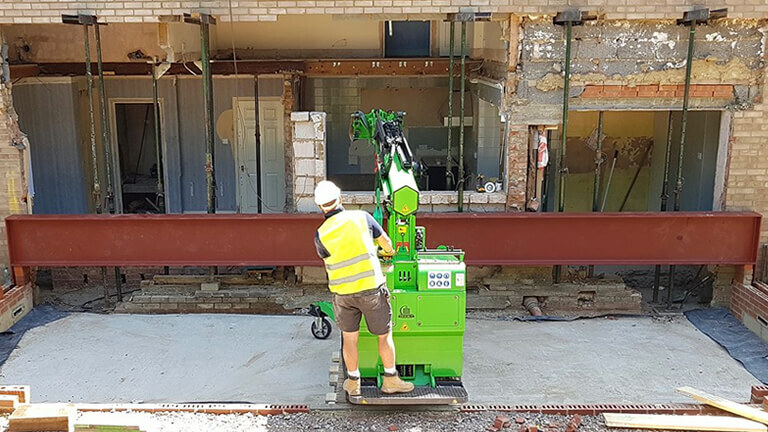 The Ultimate Steel Beam Lifting Machine! 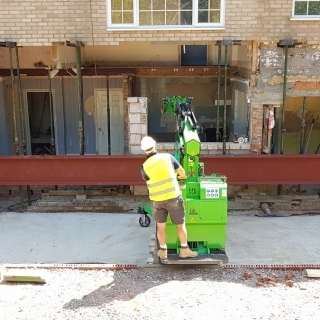 Safely lift and carry steel beams of up to 1.3 tonnes using the specifically designed steel beam manipulation head. 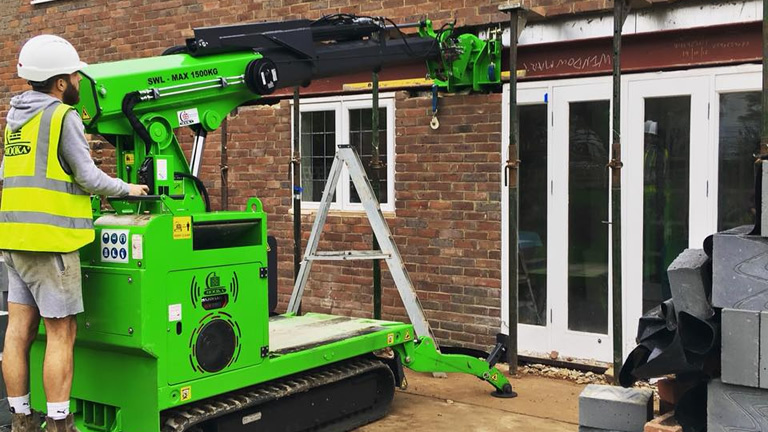 With it’s specially designed Steel Beam Manipulation Head attachment on the crane jib, the Hooka is the ideal steel beam lifter and makes moving and installation of steel beams easier than ever before. 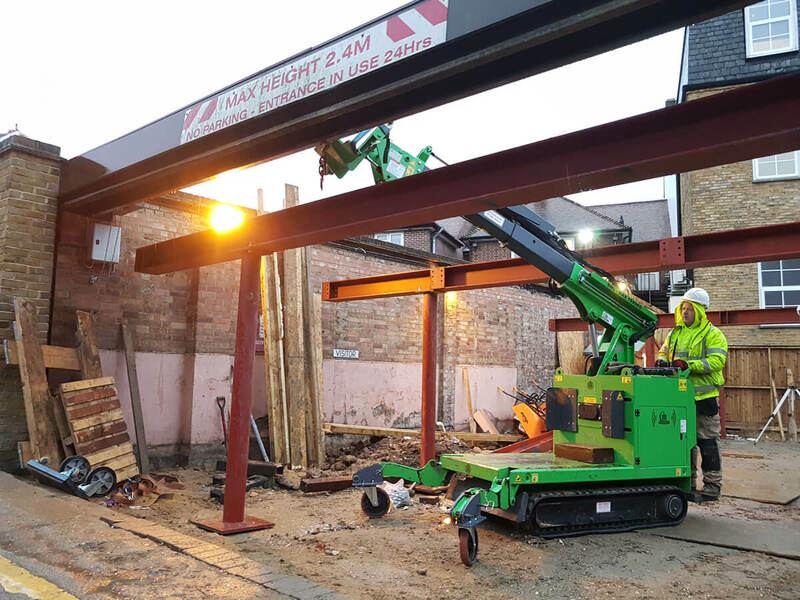 Contact us above to hire the ultimate steel beam lifter. 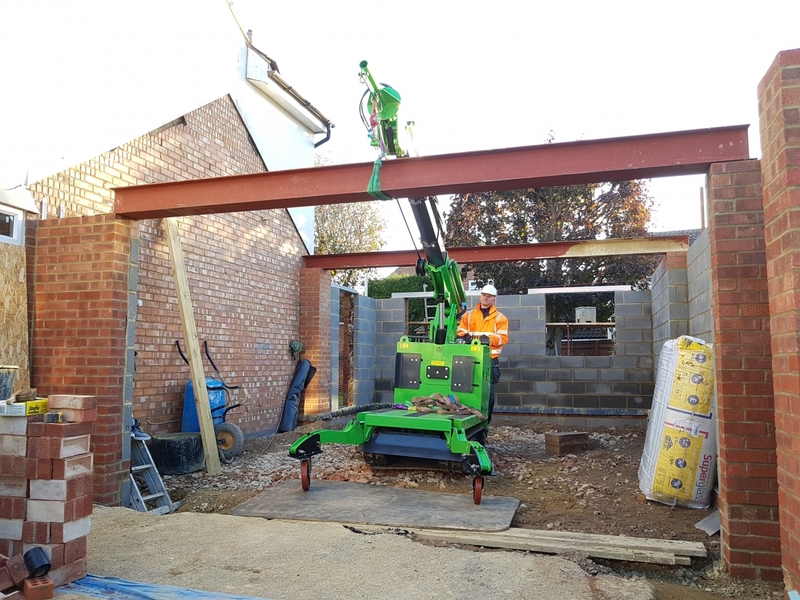 Below you will see examples of the Hooka mini tracked crawler crane quickly, efficiently and safely helping with the installation of steel beams up to 1.3 tonnes each. 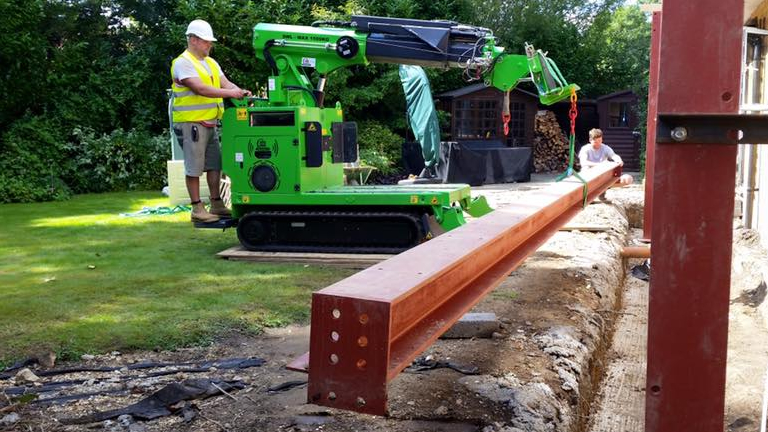 The Hooka – 2 Huge I-Beams Weighing up to 1300 kg Installed for a Stress Free Weekend! 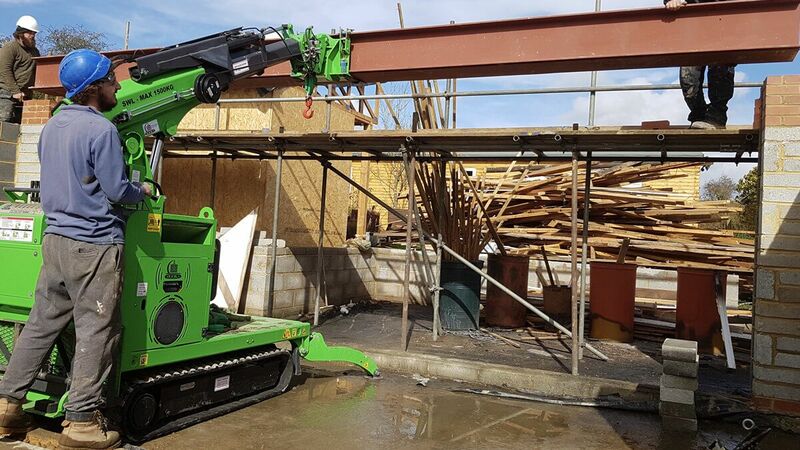 The Hooka all terrain mini tracked crane safely and easily installs steel I-beams even in the most restricted sites. 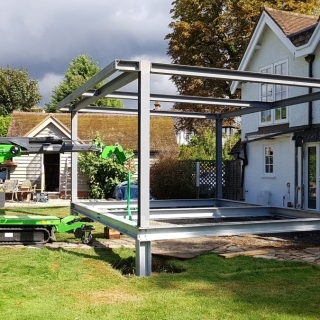 The Hooka was set a ‘next level’ challenge by Cuffley Builder, Tarkan, who needed 2 huge I-Beams installed for a stress free weekend! 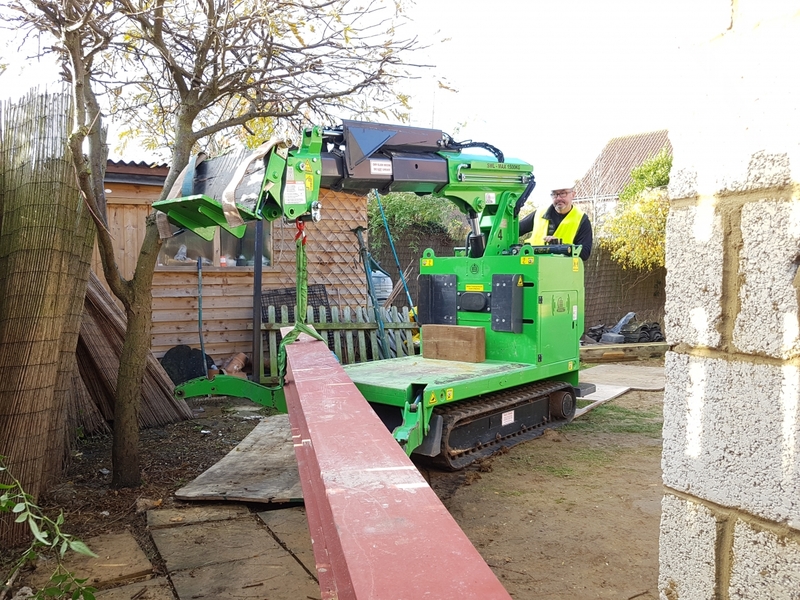 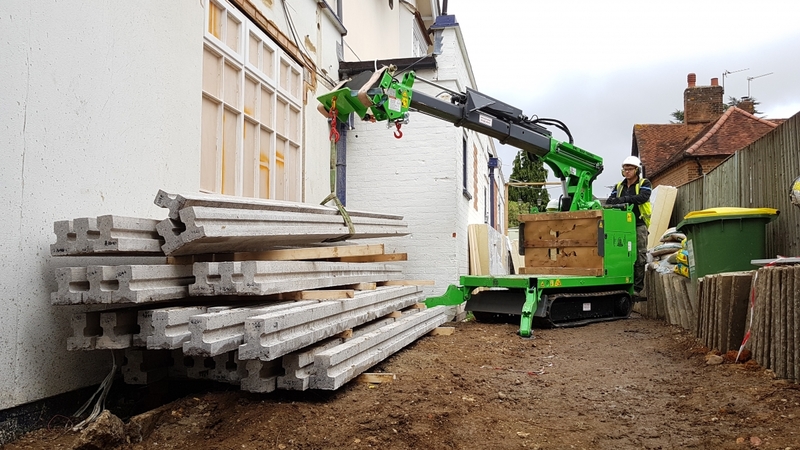 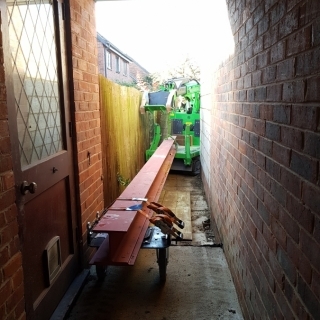 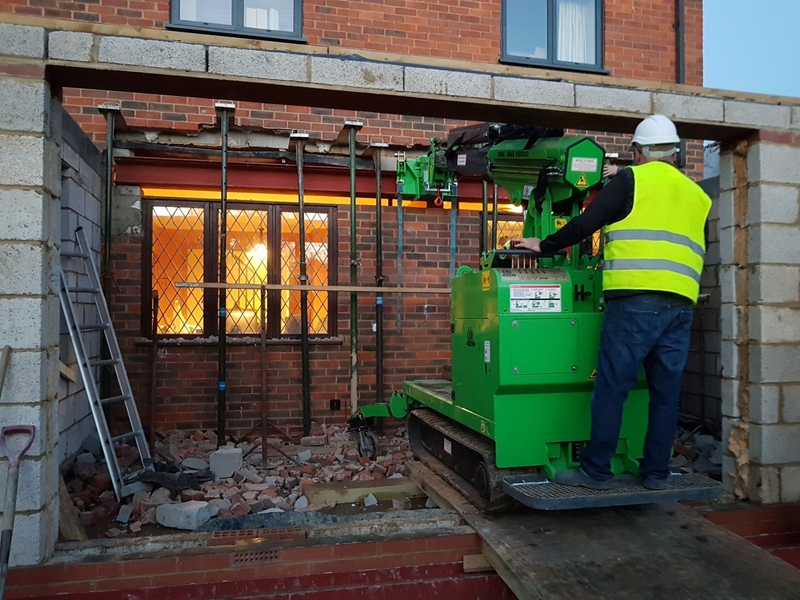 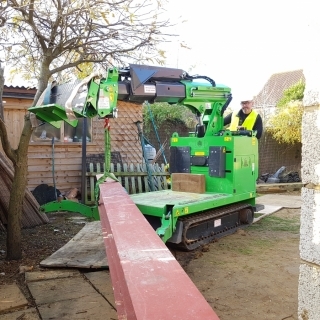 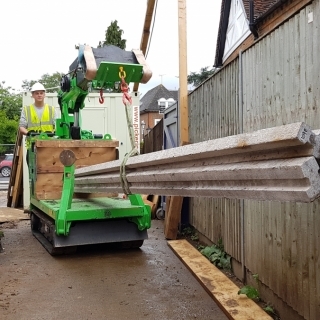 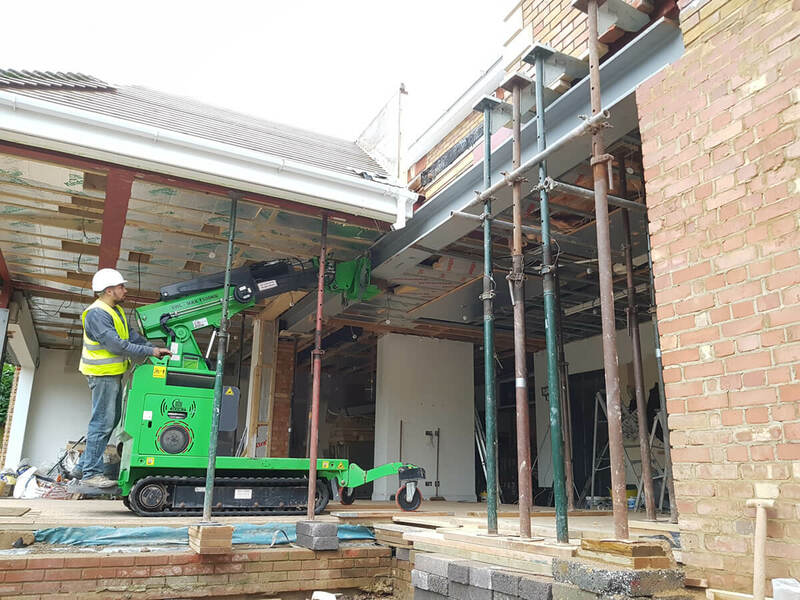 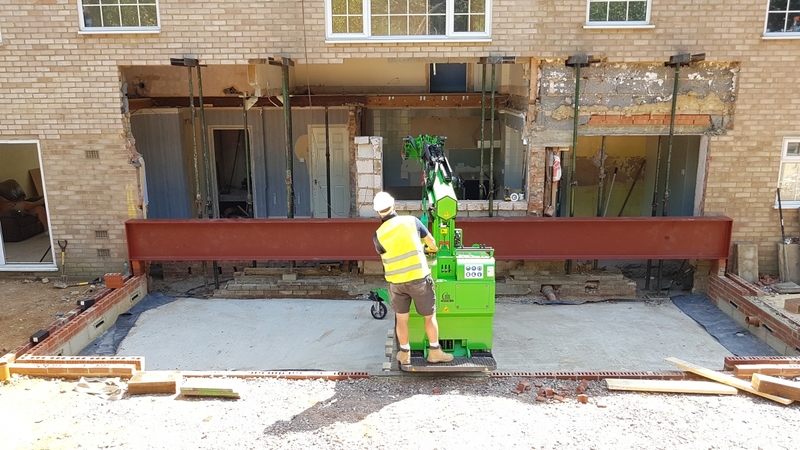 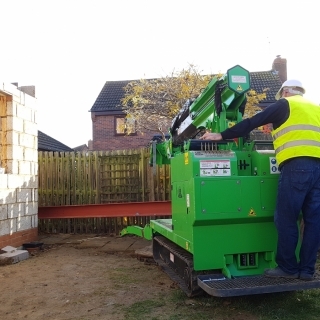 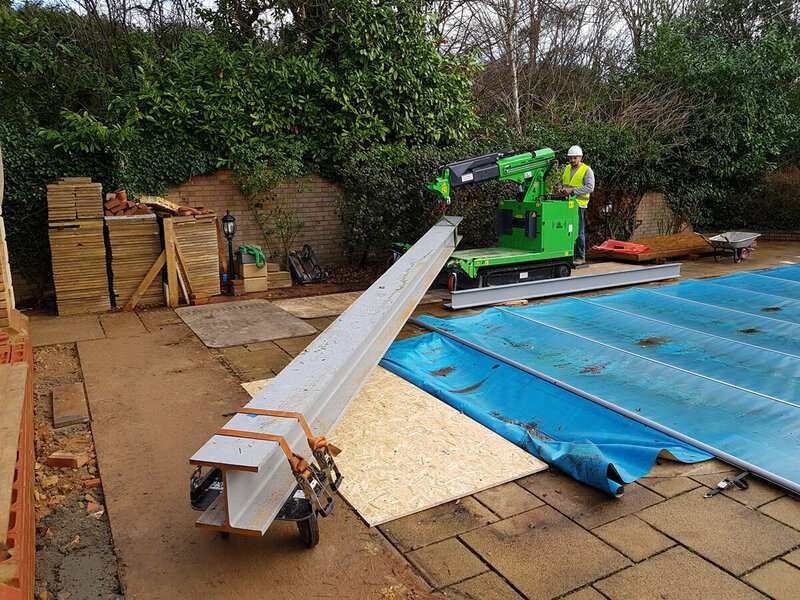 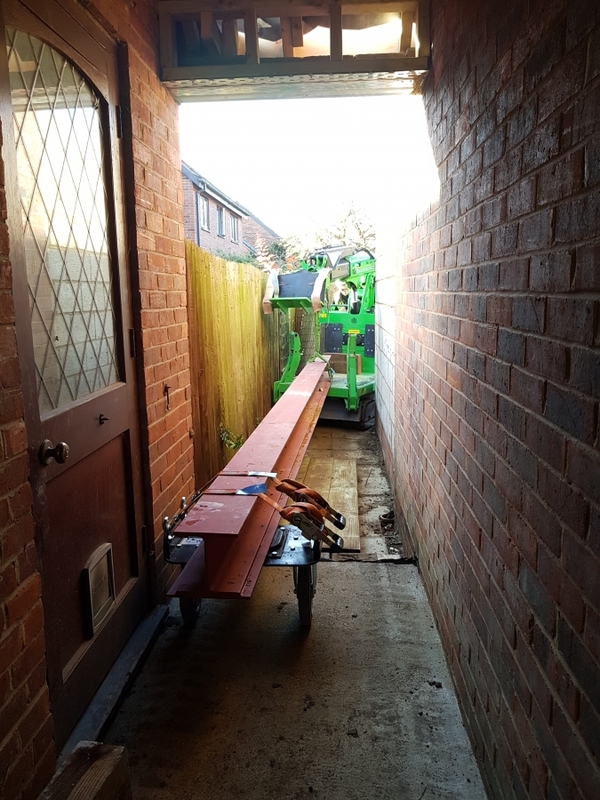 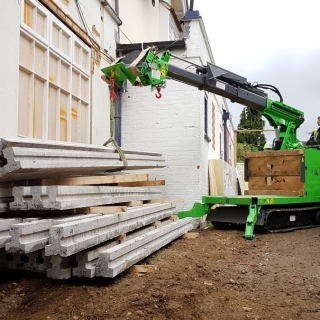 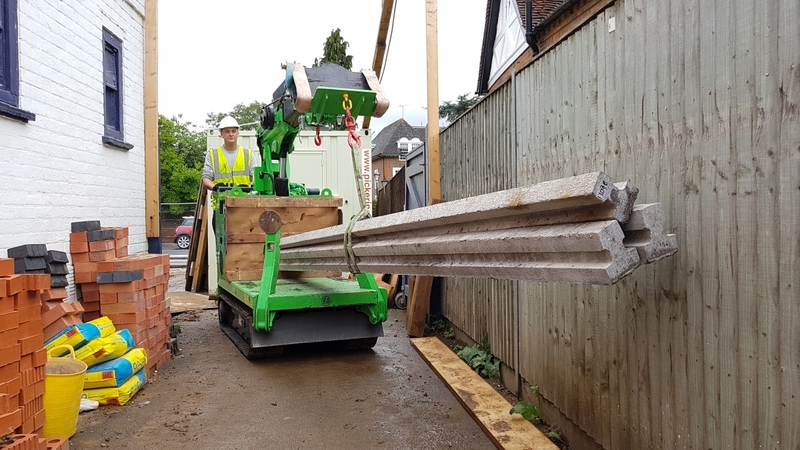 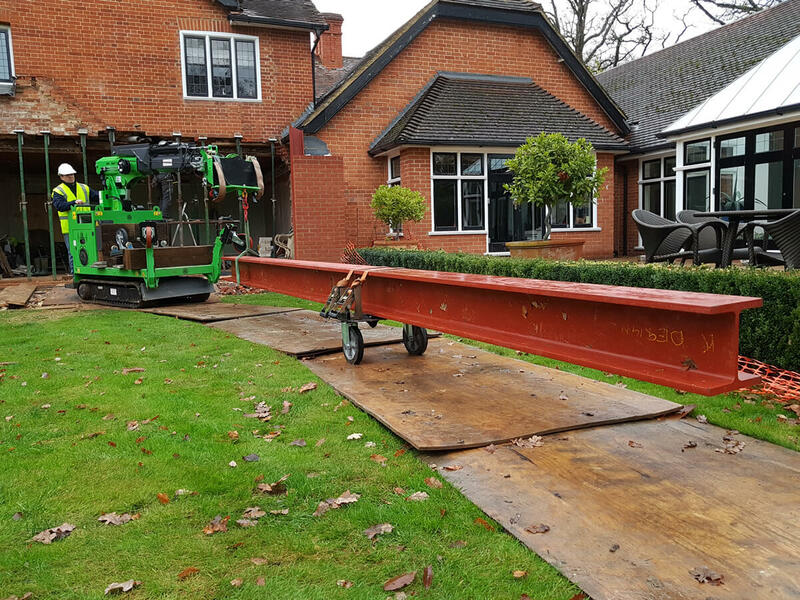 This included manoeuvring a 1300 kg steel beam over the corner of the swimming pool, before being lifted up 500mm onto the pre-existing property’s floor. 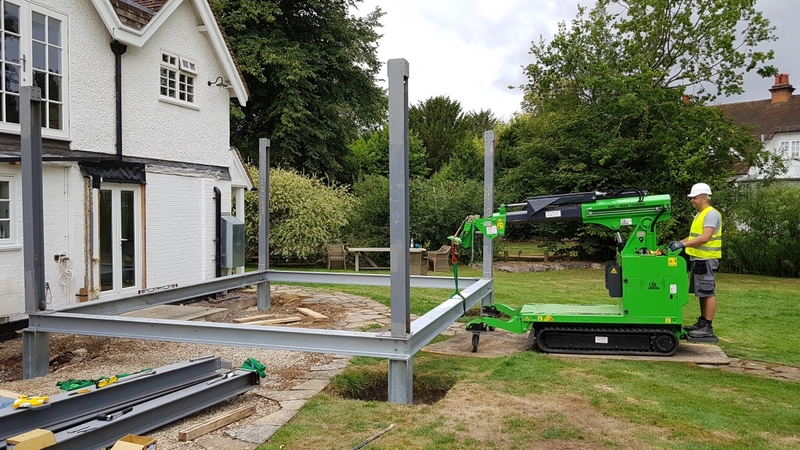 The Hooka – 16 Steel Beam Frame Assembly Built in One Day! 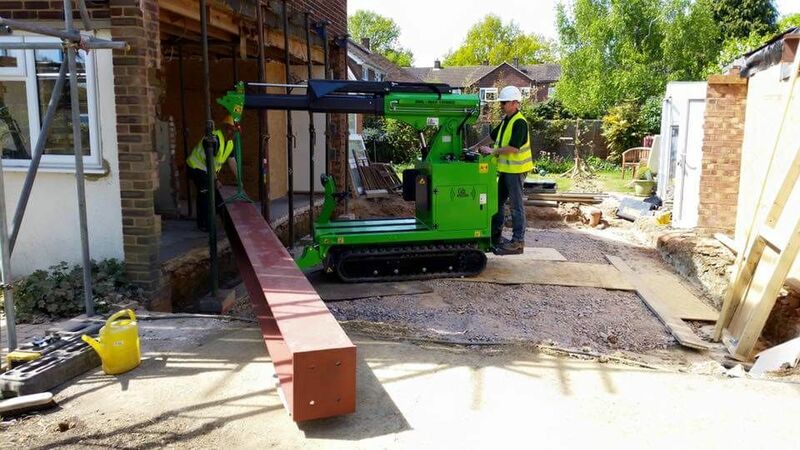 The Hooka mini tracked crawler crane is the ideal steel beam lifter for quick, easy and safe steel beam installation. 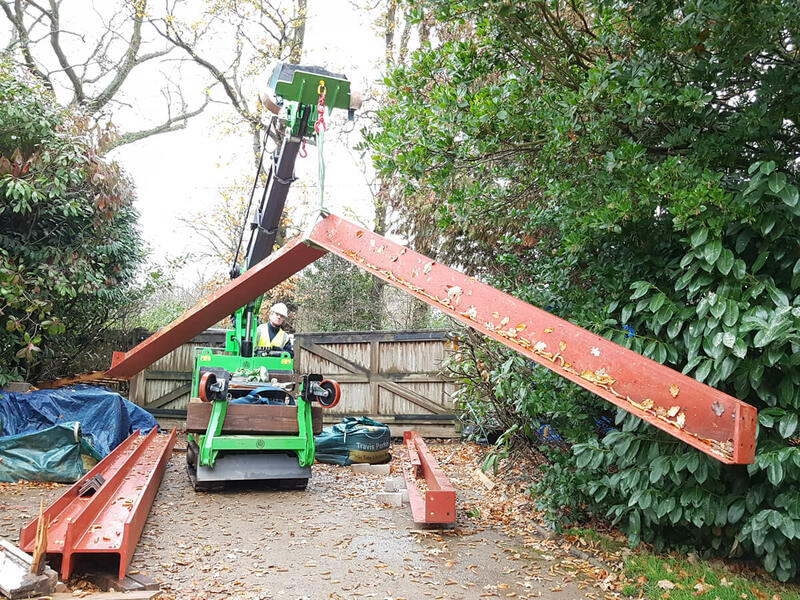 On this contract lift the Steel I-Beams had to be assembled in a specific order to construct the complete steel frame to make sure it was set square on its foundations. 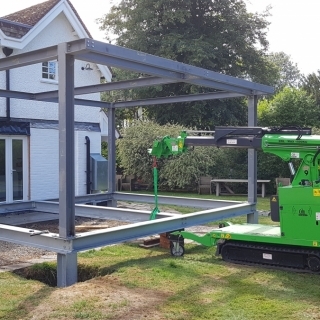 The Hooka’s ‘turn on the spot’ manoeuvrability allowed it to fit the upright steel columns and horizontal cross beams all from one central point. 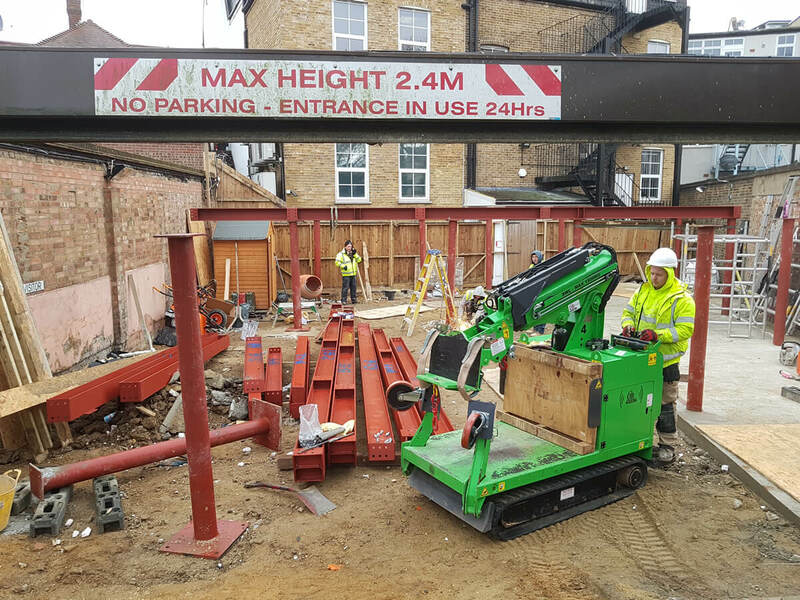 K Design set the Hooka mini tracked crawler crane a 4 Steel RSJ I-Beam challenge. 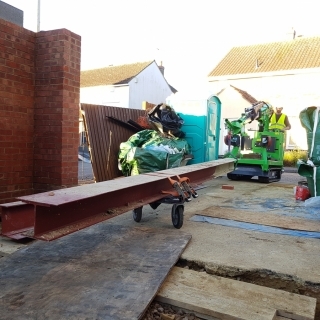 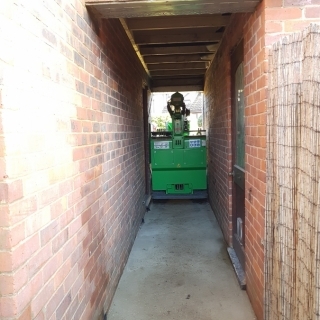 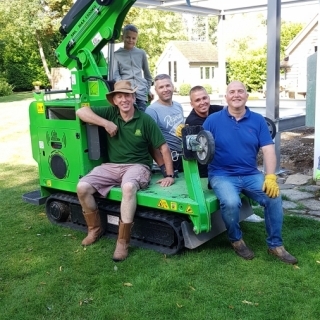 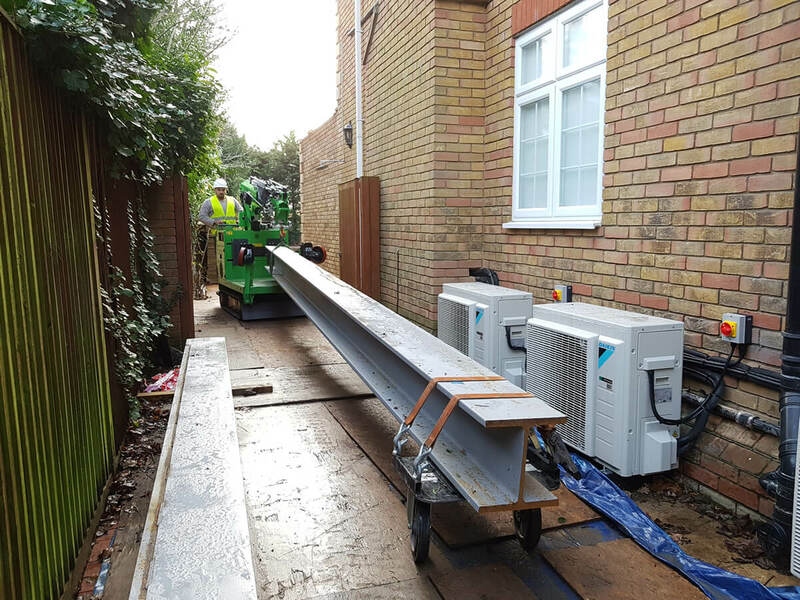 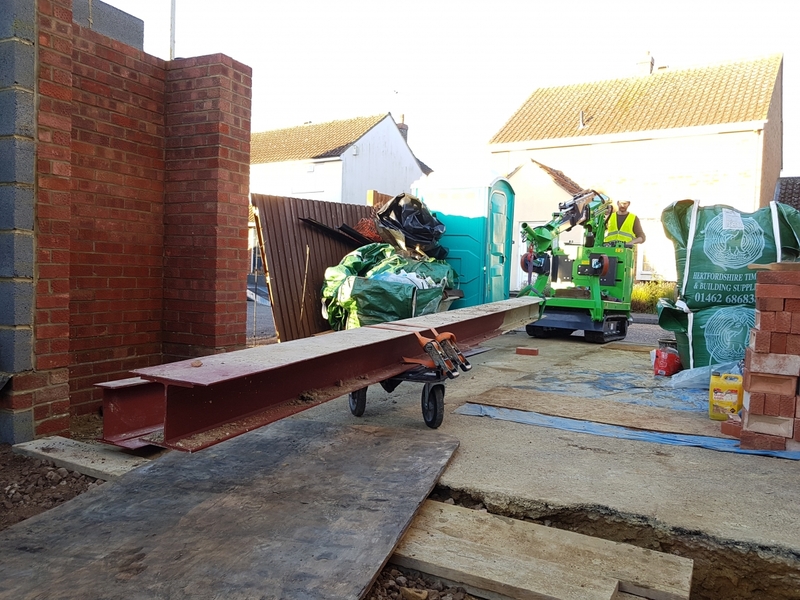 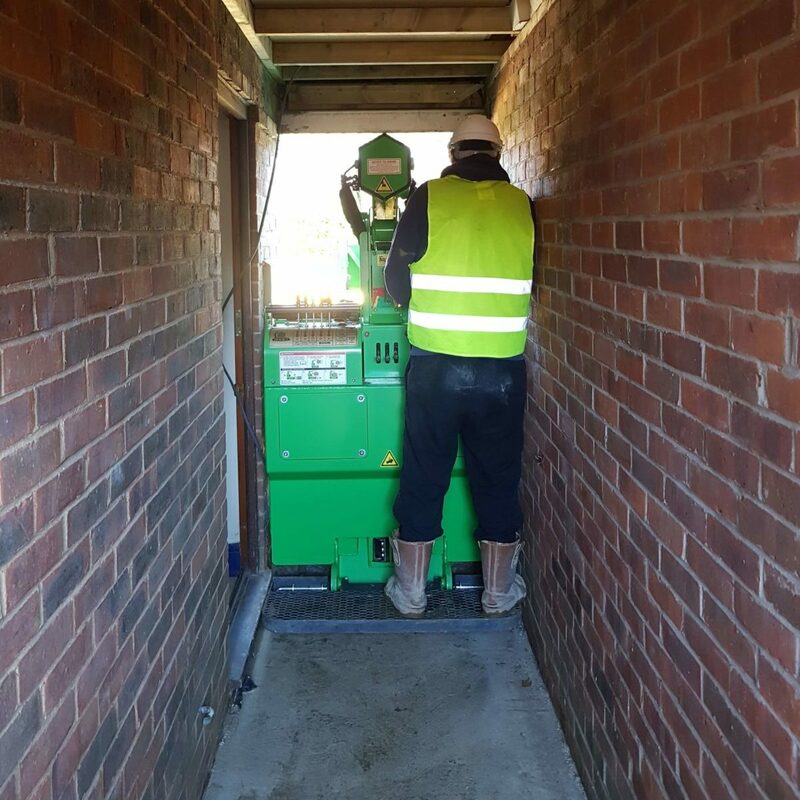 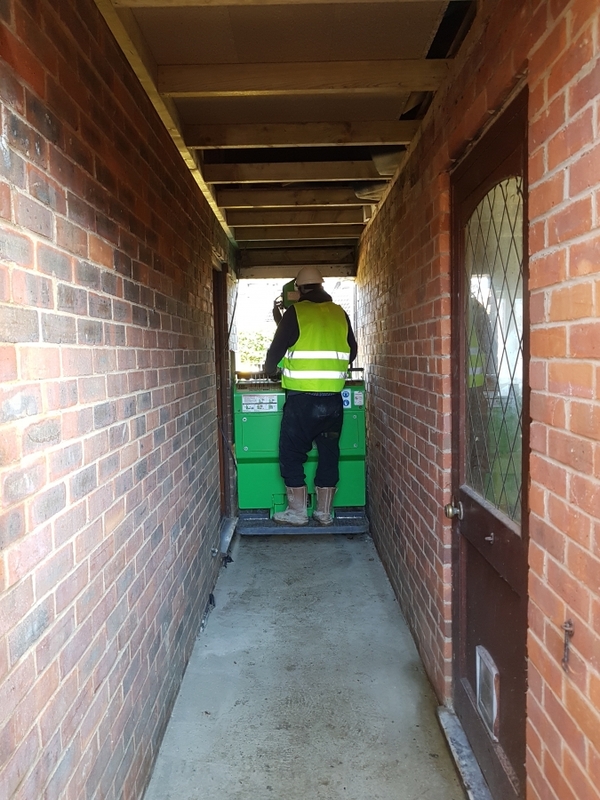 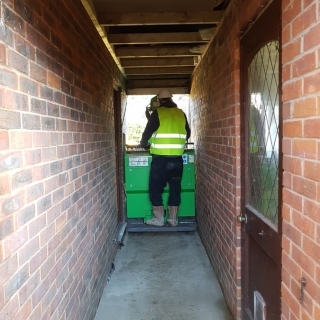 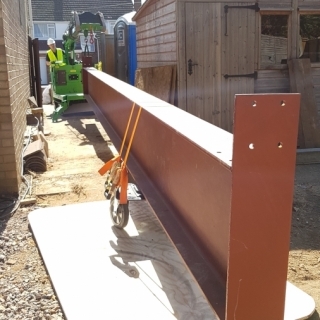 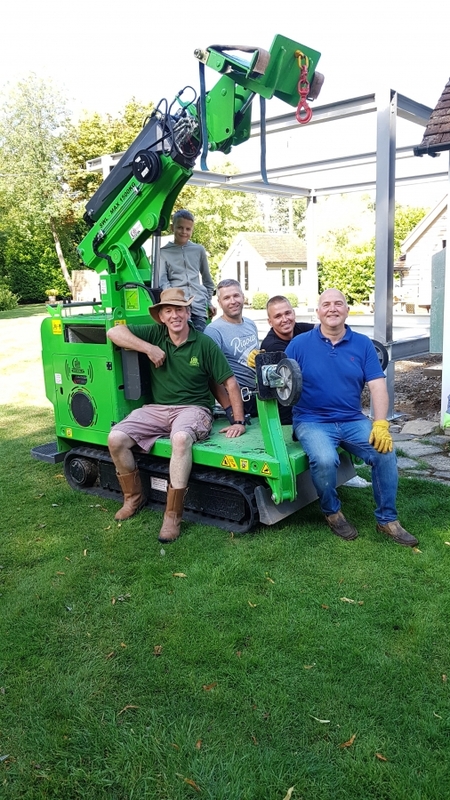 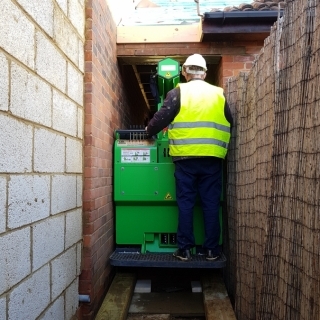 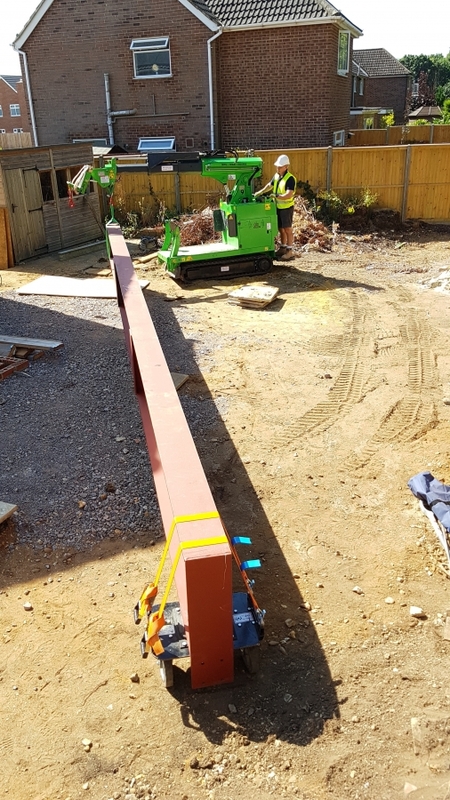 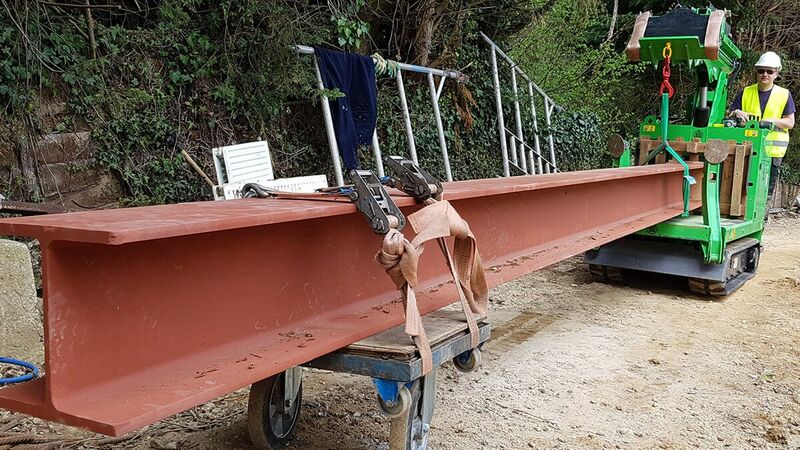 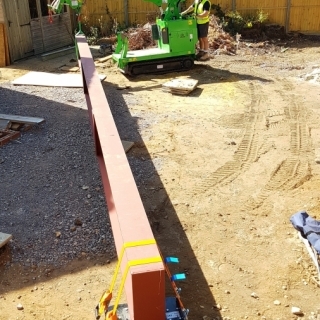 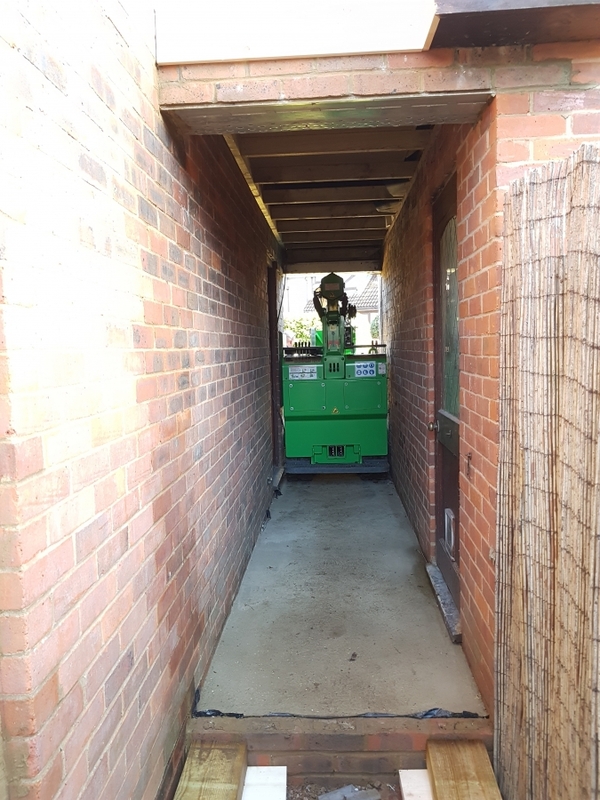 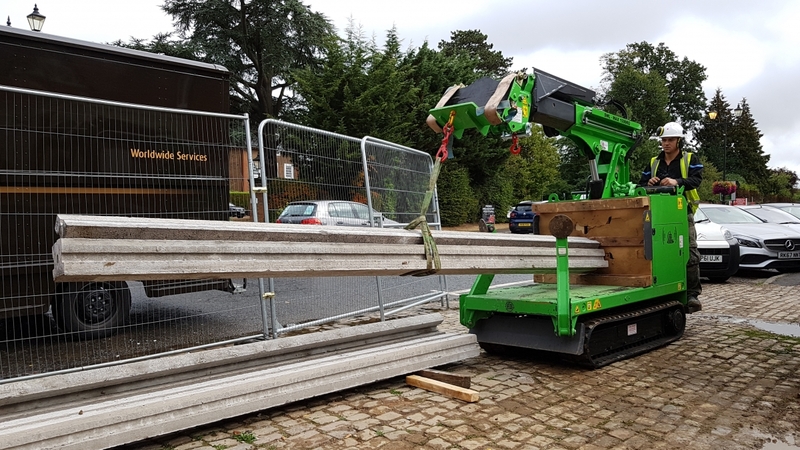 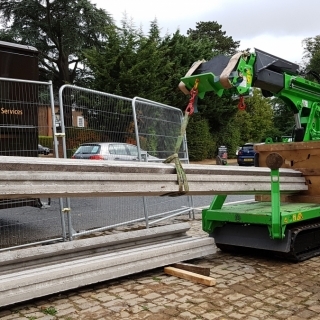 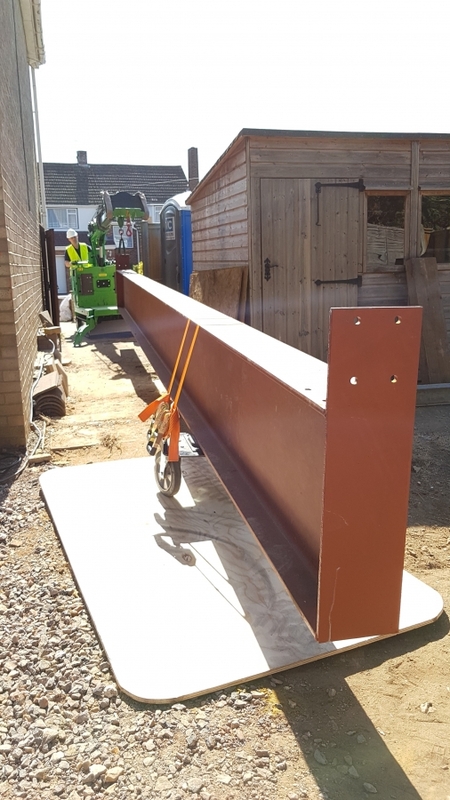 The steel RSJs ranged from 300kg to 950kg and had to be towed and carried 100 metres into the site through a restricted access without causing damage to the mature gardens. 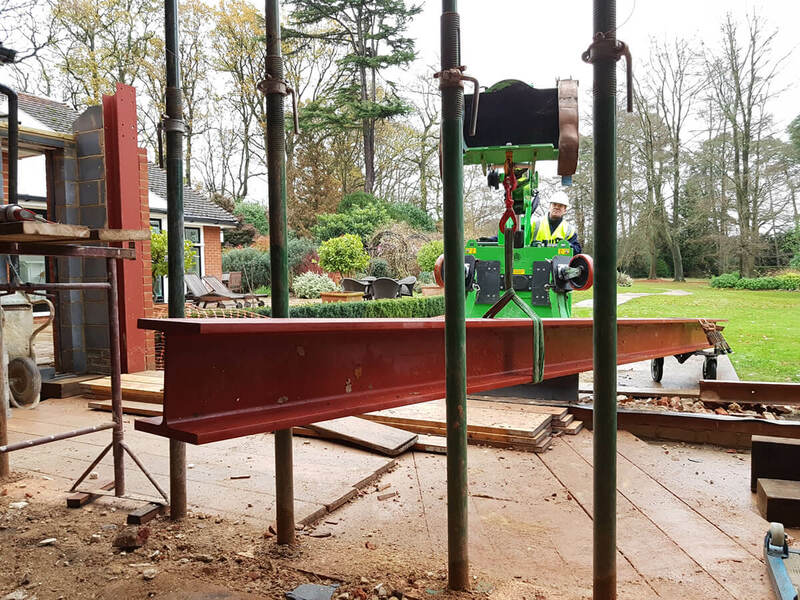 The Hooka’s lightweight and load spreading tracks allowed it to run on a 13mm plywood trackway to deliver the steel beams to the installation area. 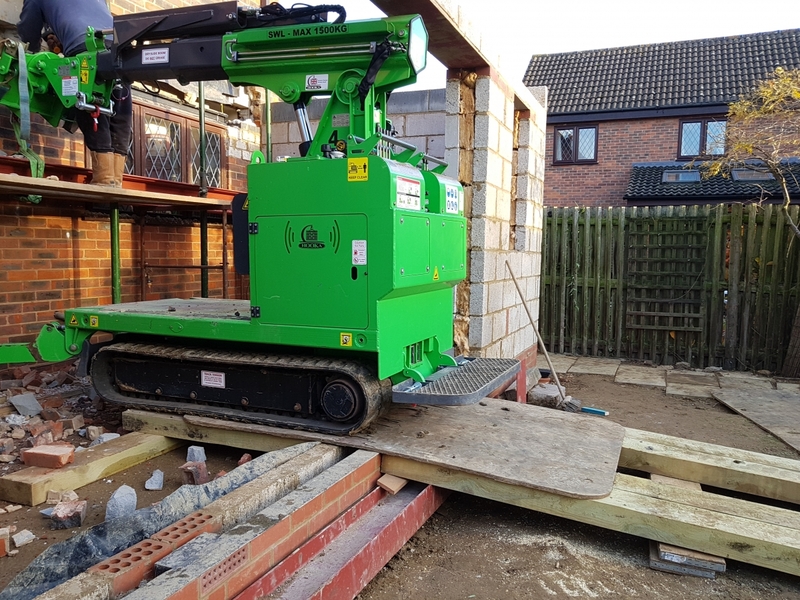 The Hooka mini tracked crawler crane took ‘restricted access’ to the next level this week! 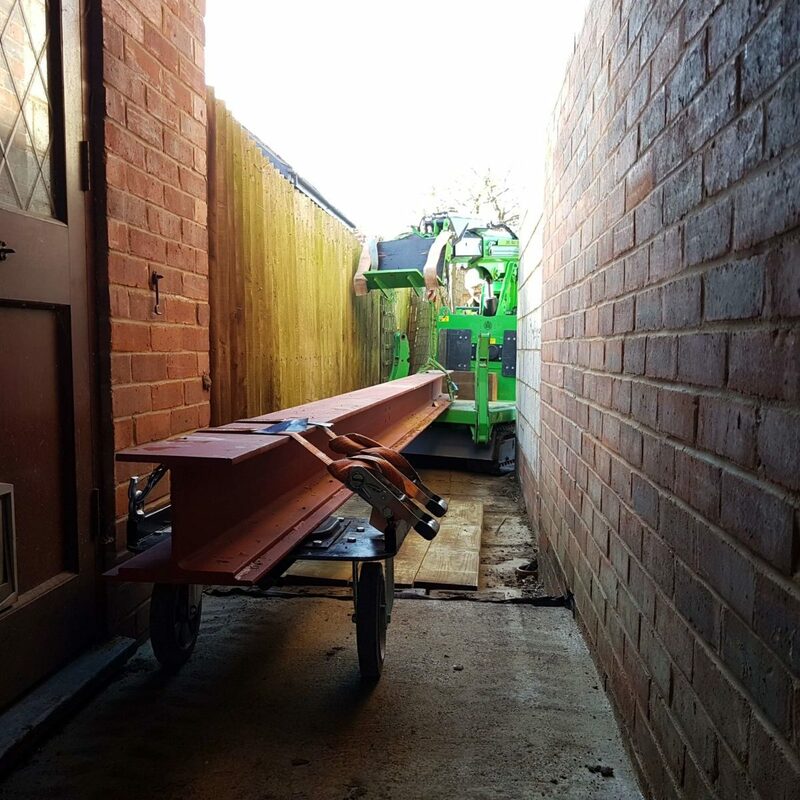 The 450kg Steel I-Beam install had to go in through a 2.1 metre high x 1.1 metre wide access, up and down a series of ramps, and then ‘post’ the I-Beam onto it’s piers inside a ‘letterbox’ opening. 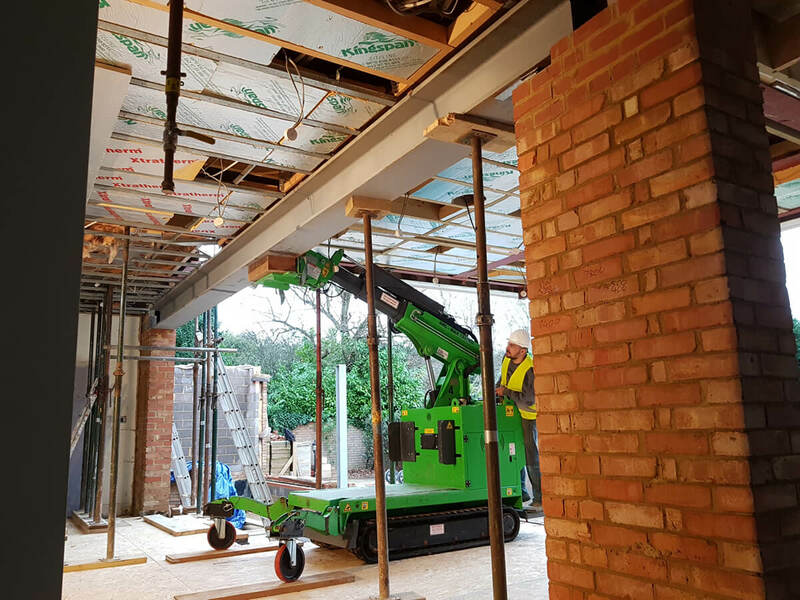 This enabled the home owner to keep the rest of their house ‘intact’ until the extension is fully completed – so reducing the ‘extension build dust and chaos’ to a minimum! 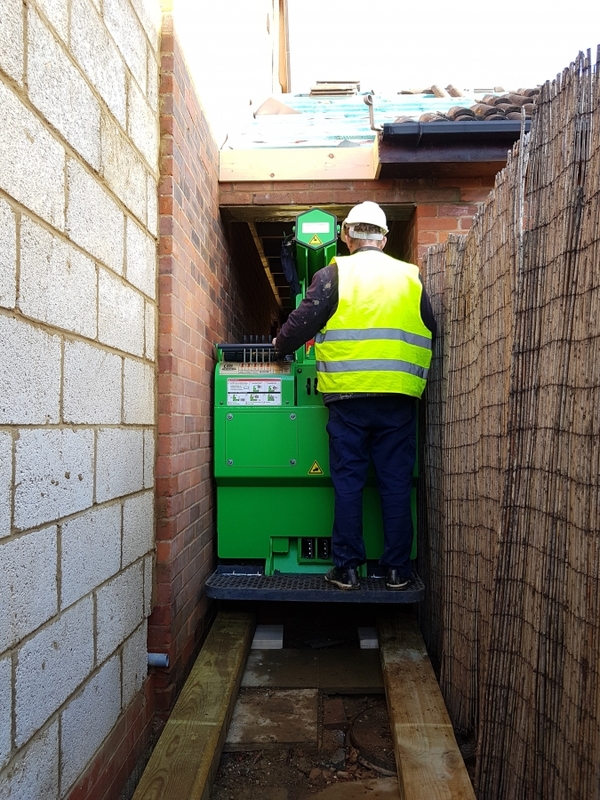 – Another satisfied customer of Lift, shift AND install! 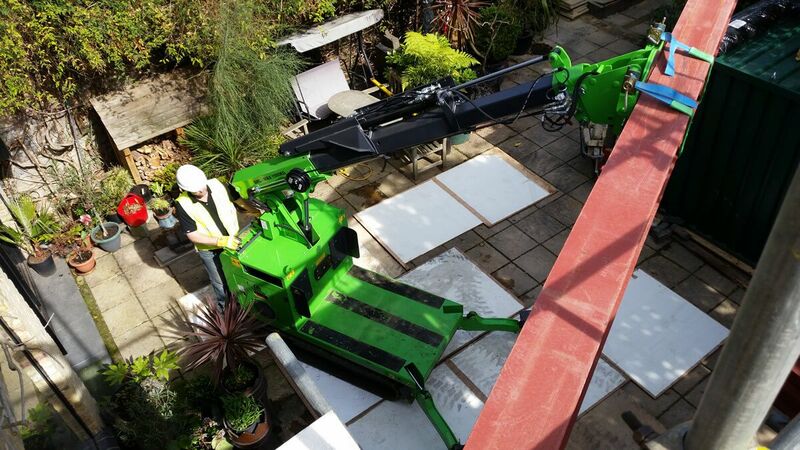 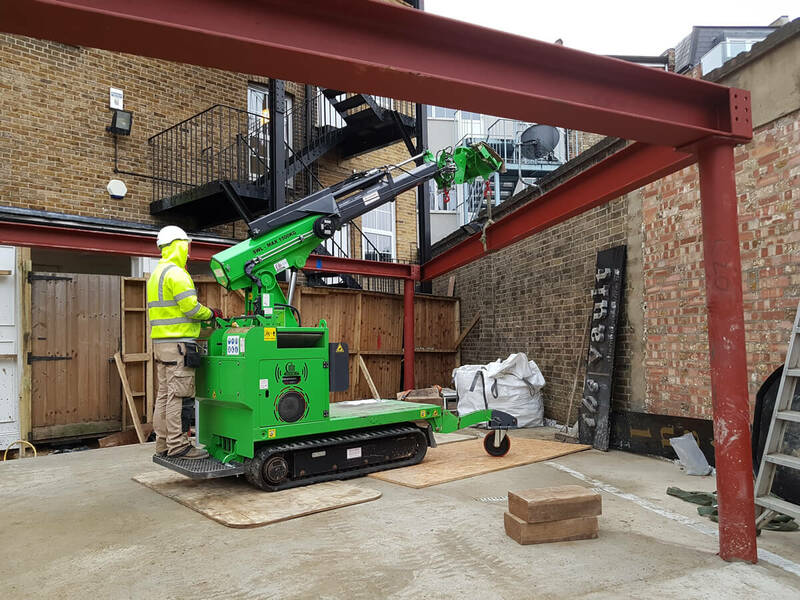 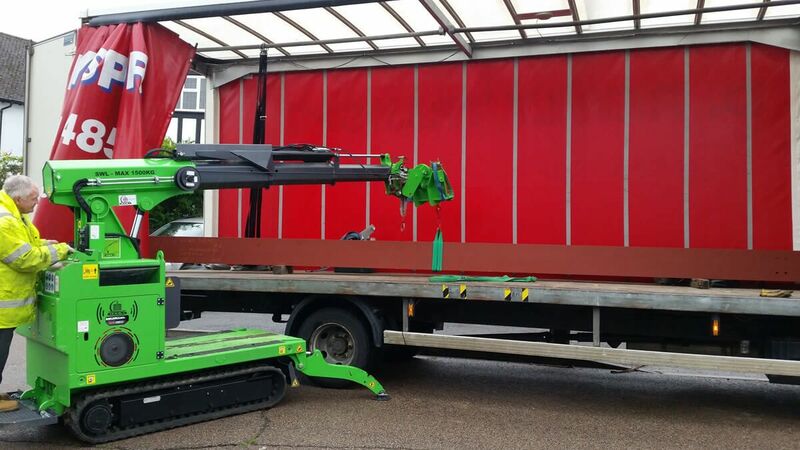 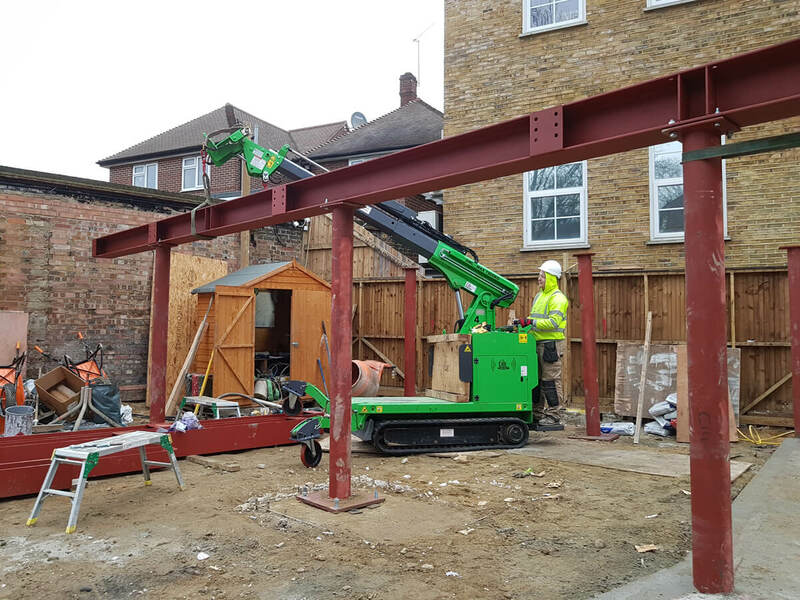 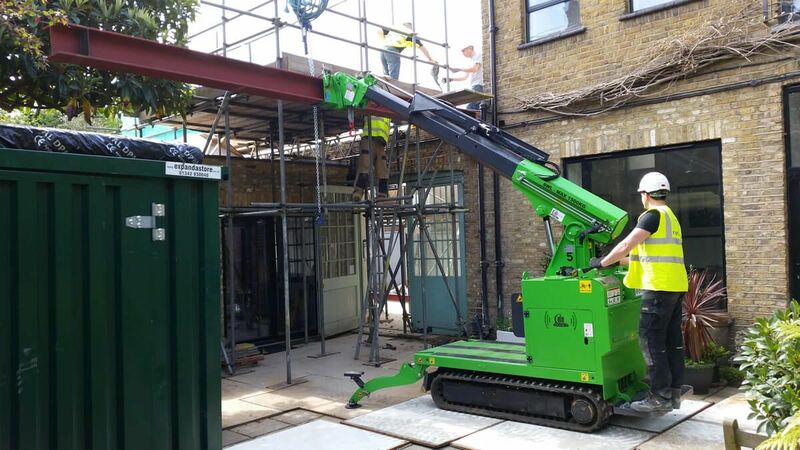 The Hooka mini tracked crawler crane was used to install several steel beams for a builder in Camberwell, London. 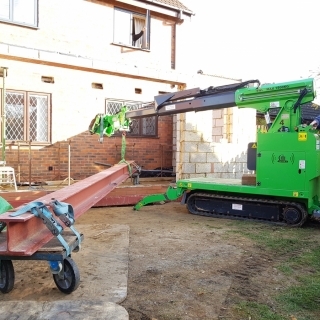 They where so impressed by the Hooka that they kept it on site to move all their materials into the rear of the property. 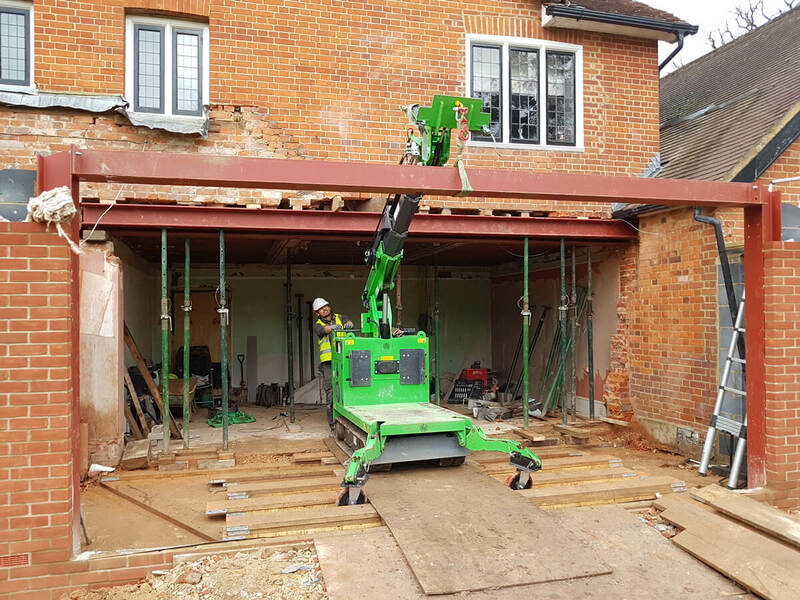 RSJ beam installation by the Hooka using the beam lifter attachment on a building site with very tight access at only 1 metre wide. 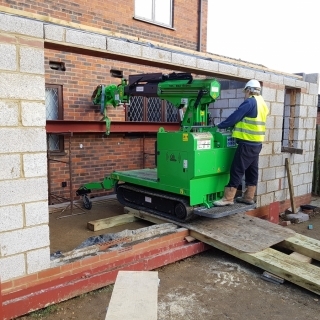 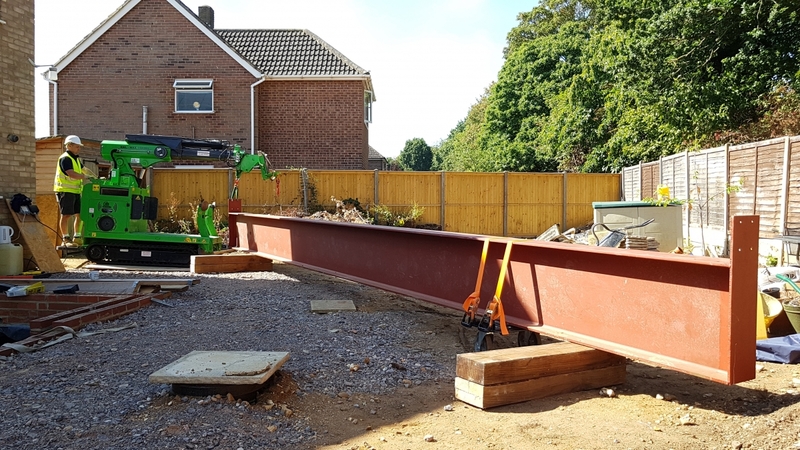 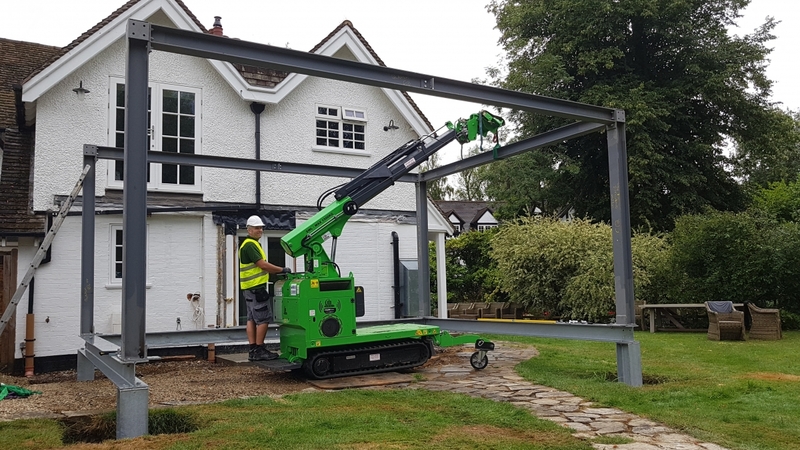 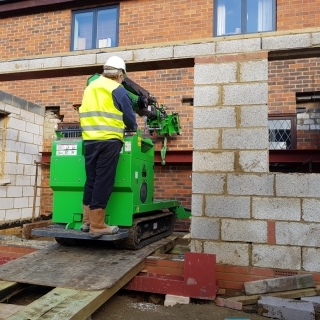 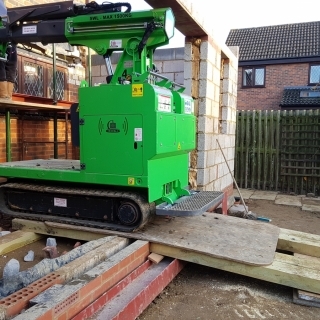 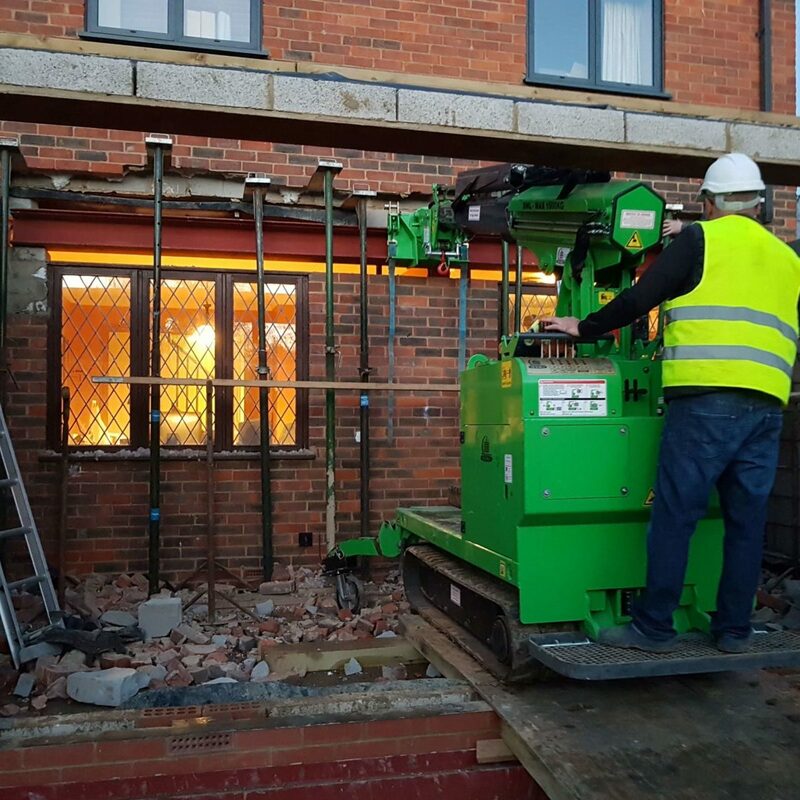 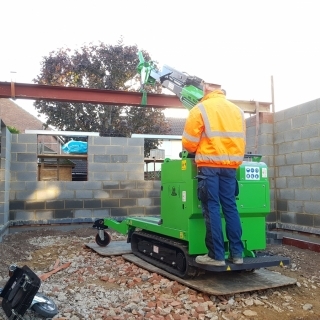 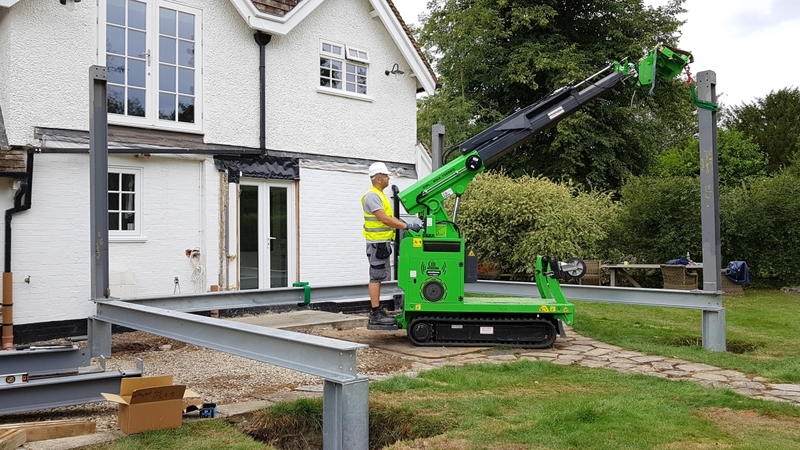 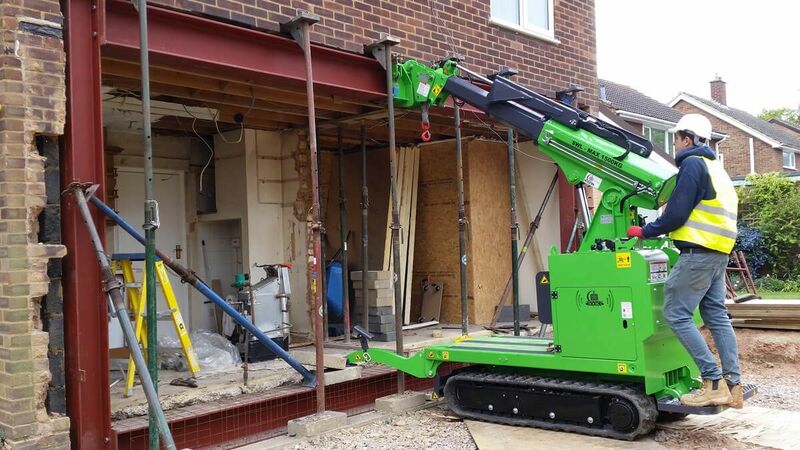 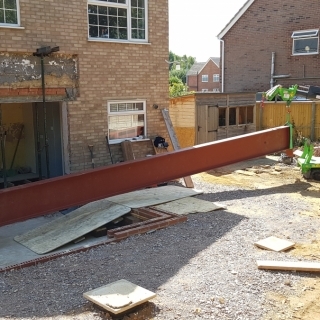 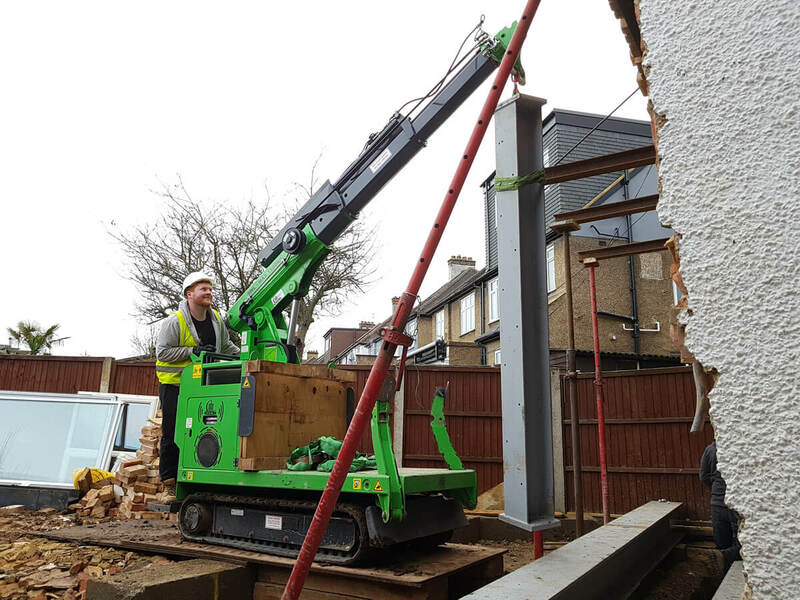 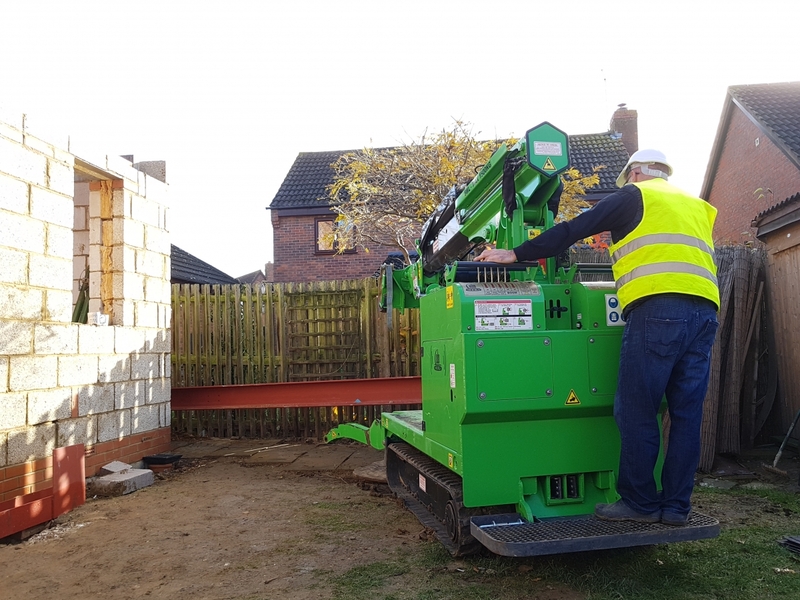 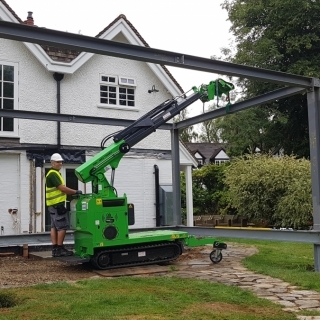 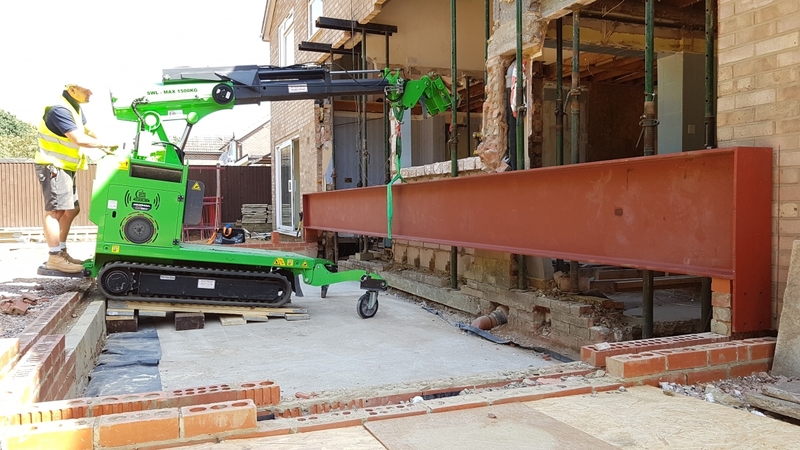 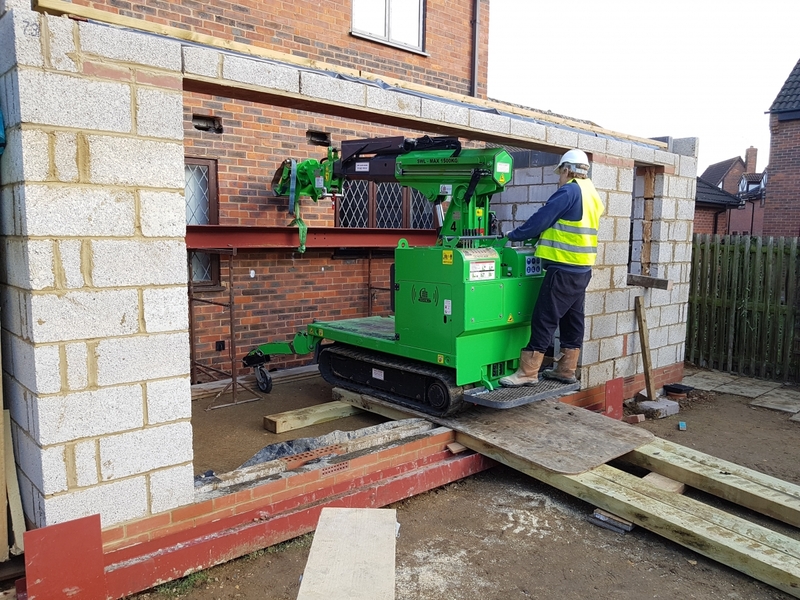 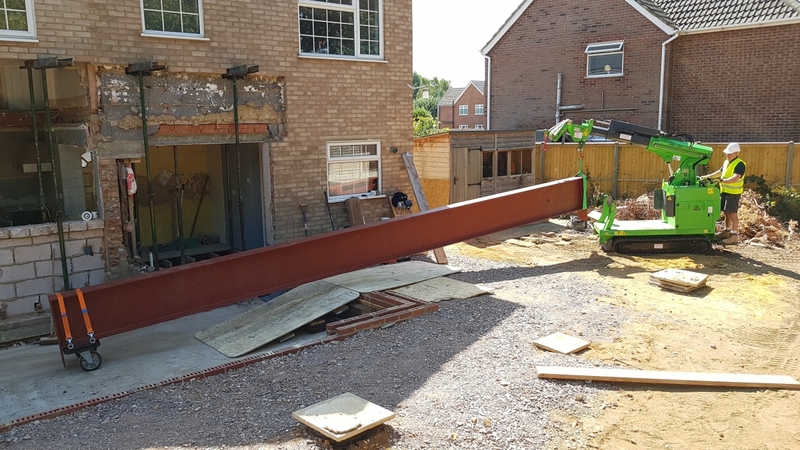 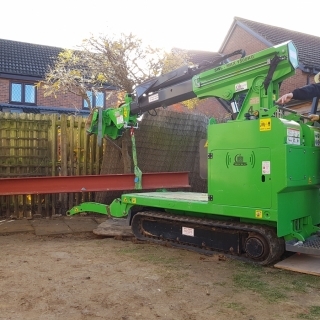 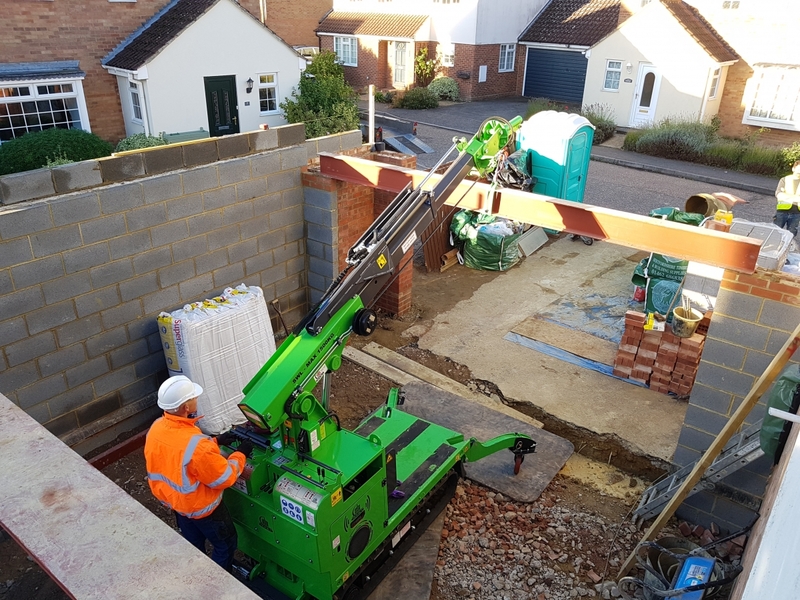 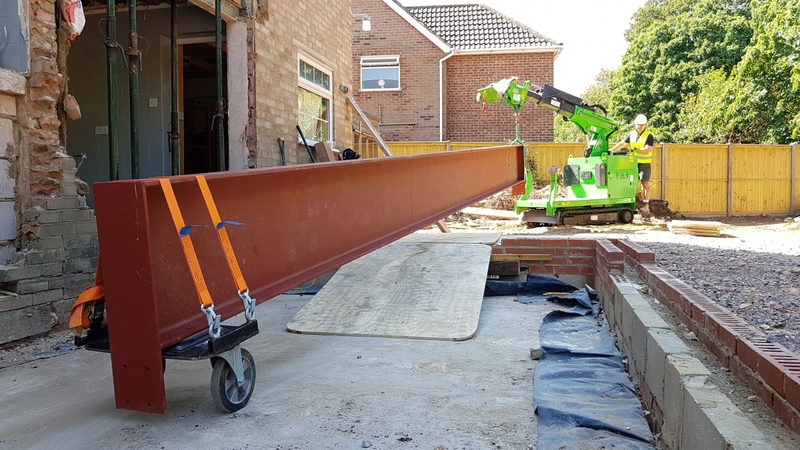 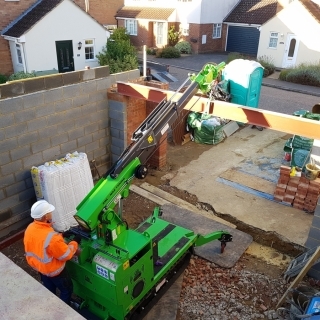 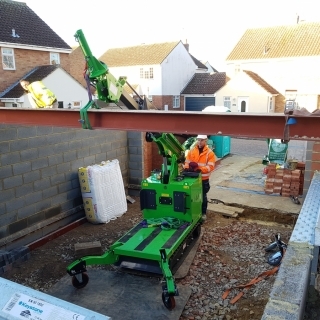 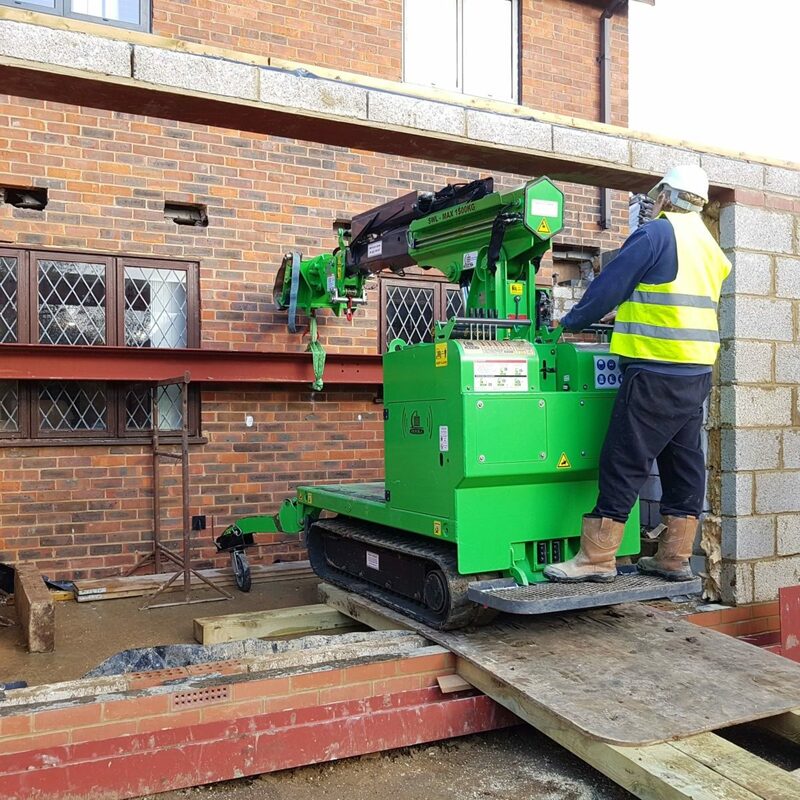 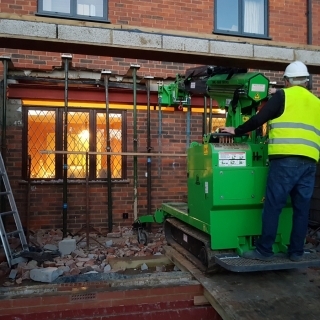 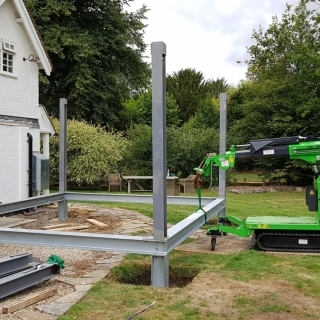 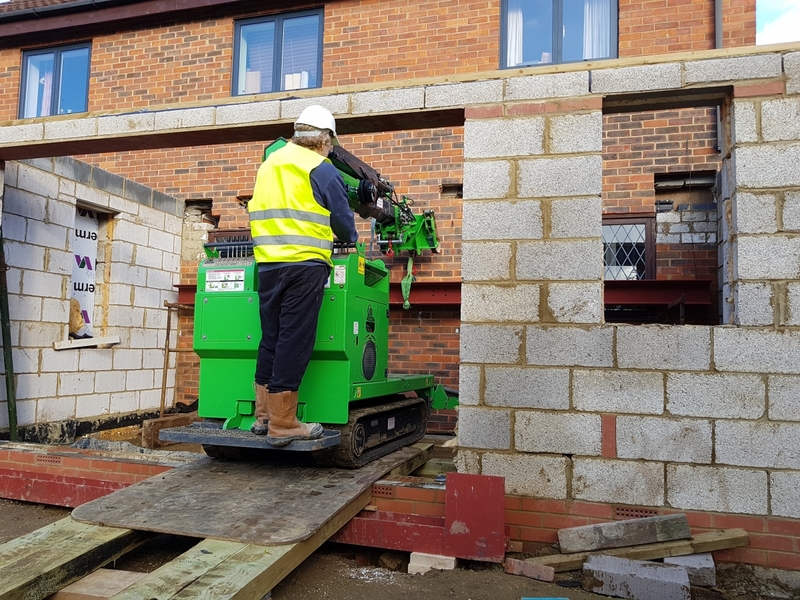 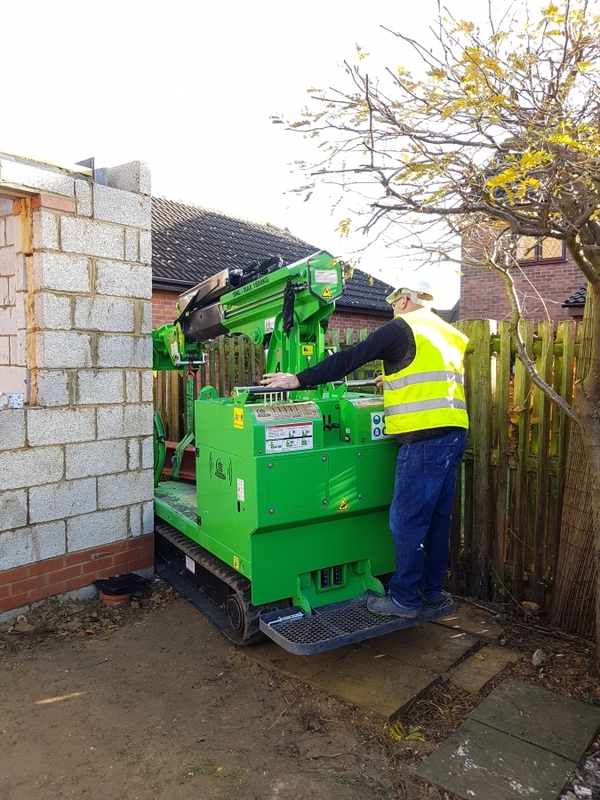 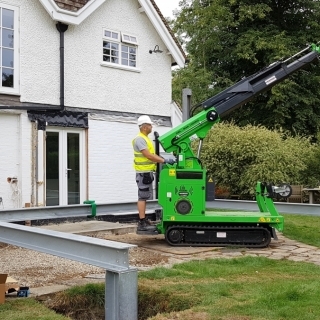 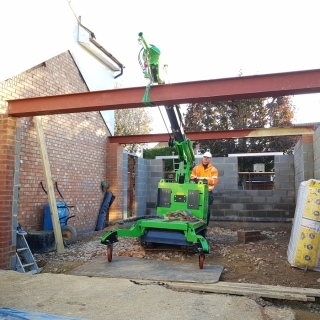 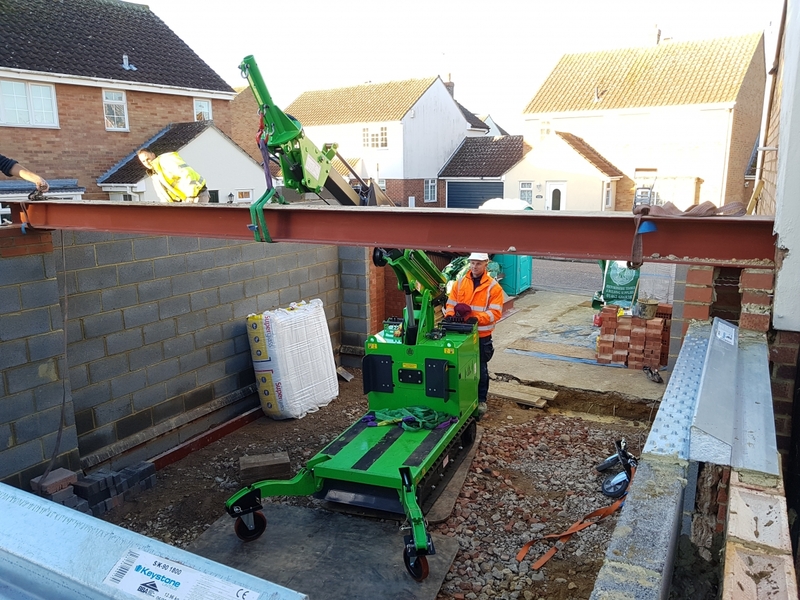 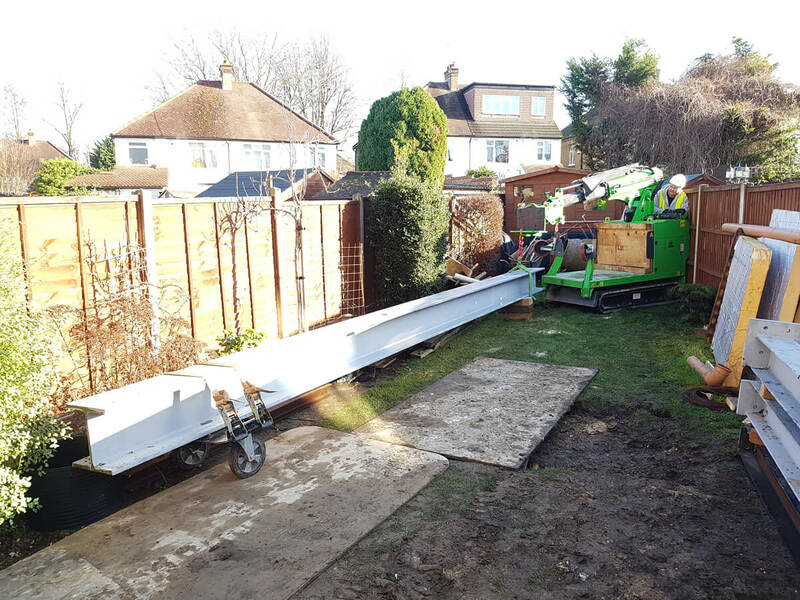 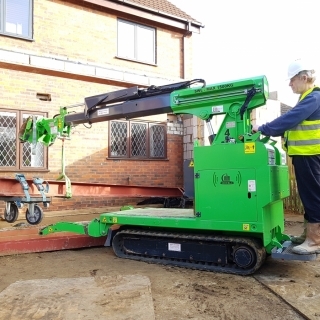 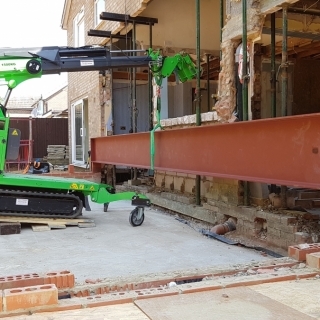 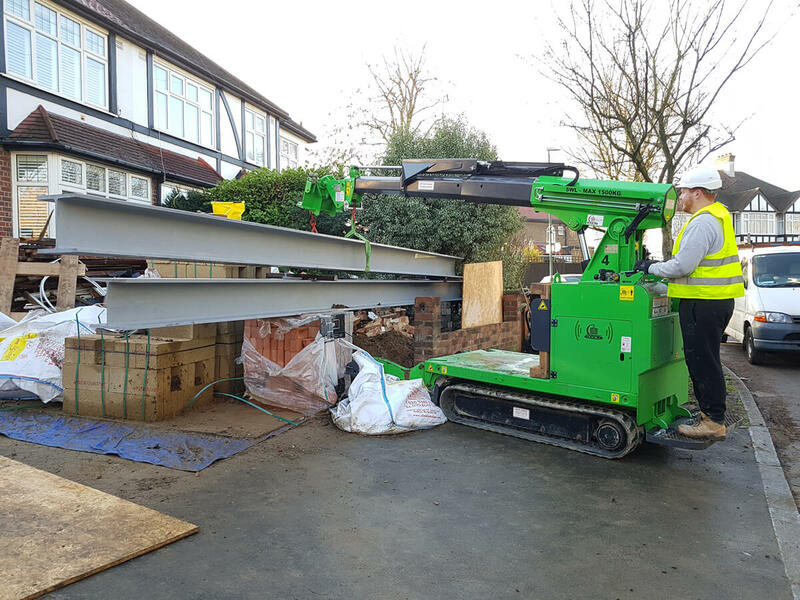 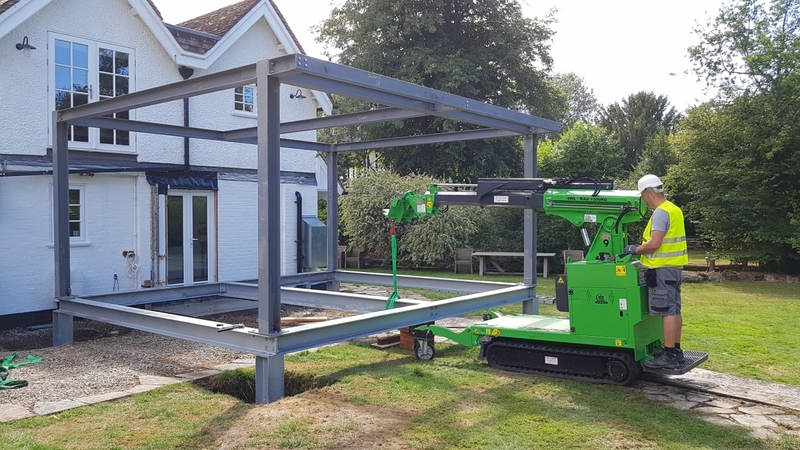 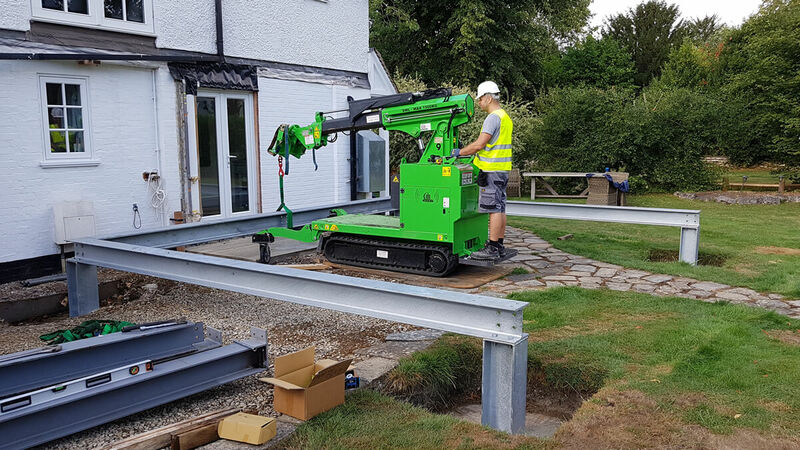 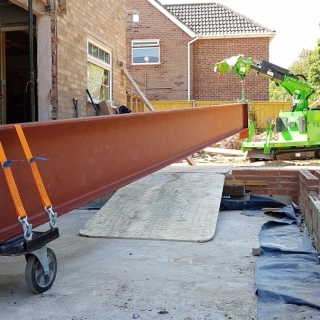 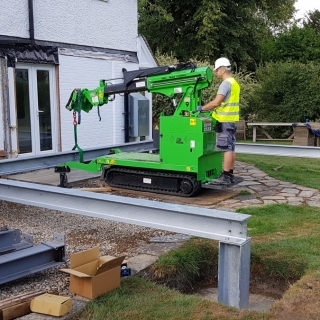 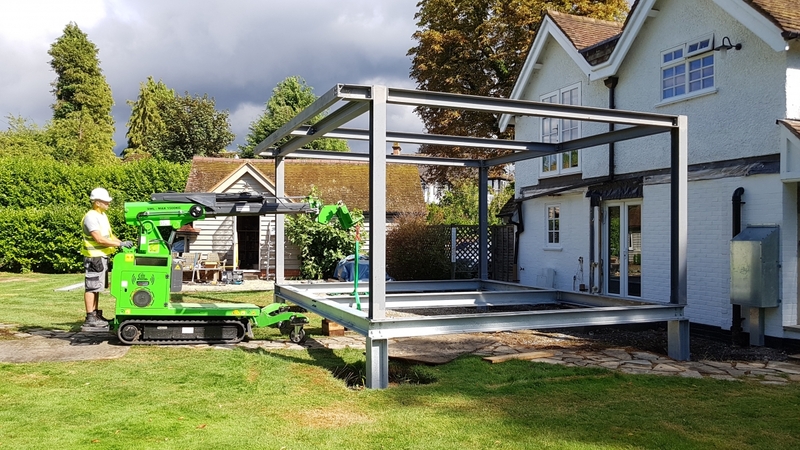 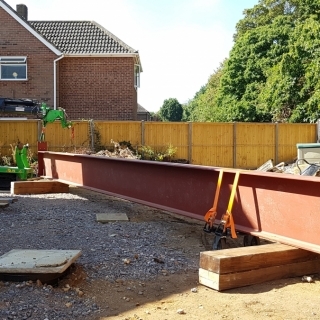 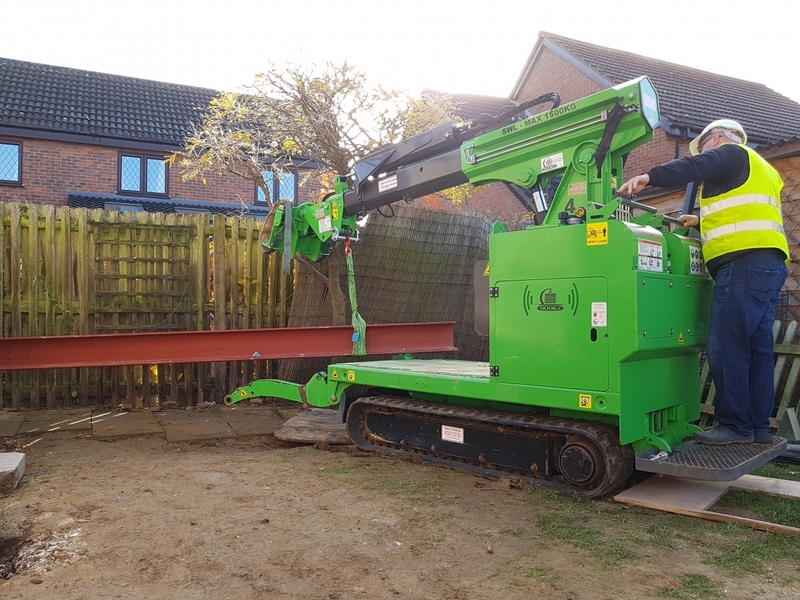 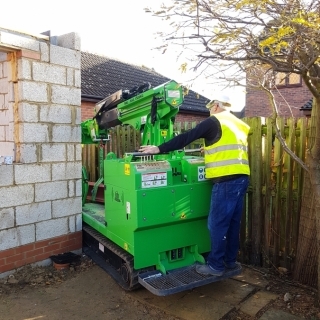 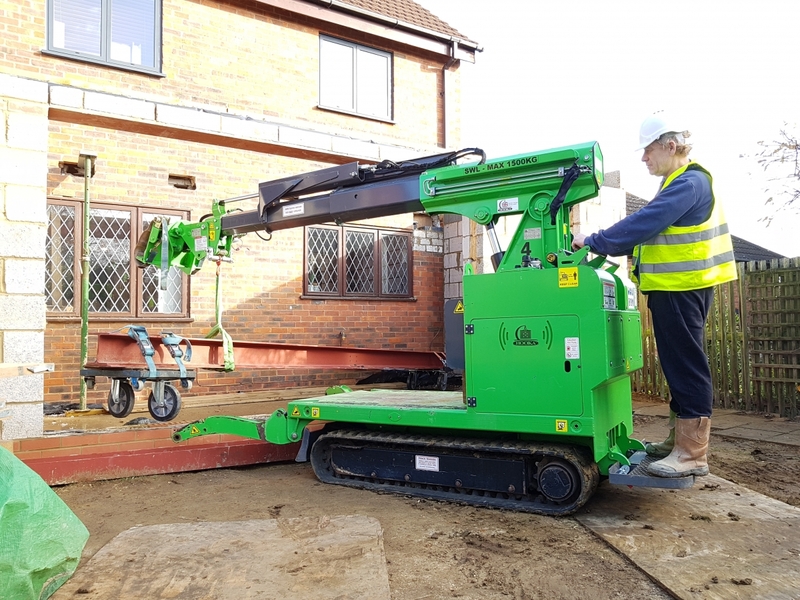 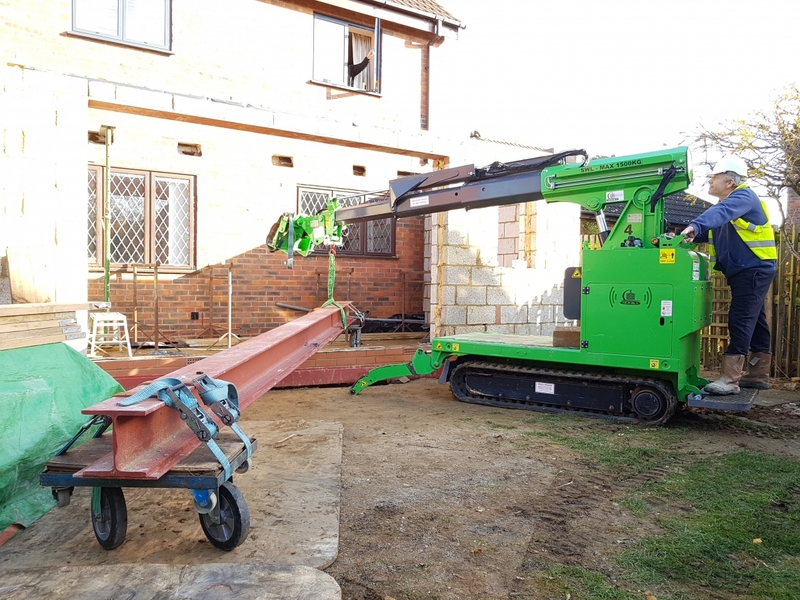 The Hooka mini tracked crawler crane was used to safely install a huge 1200kg steel I-beam for a house extension in Surrey. 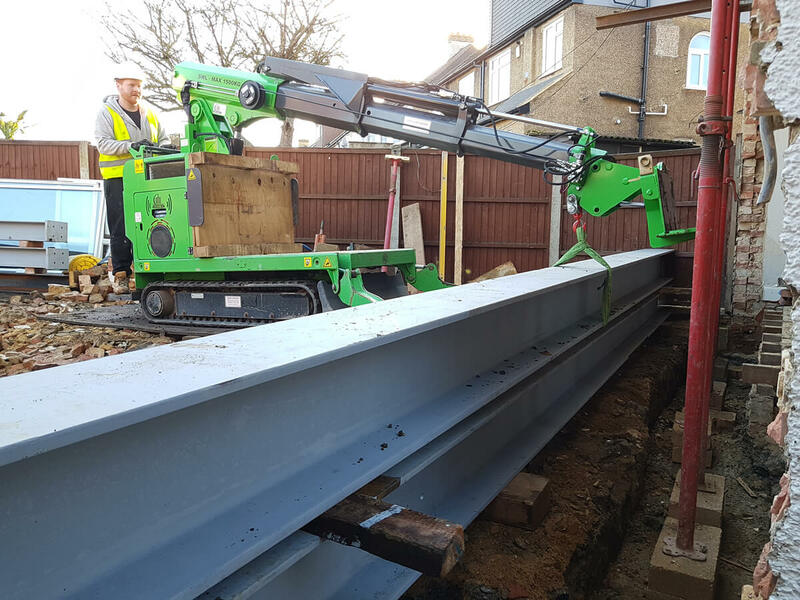 Steel beam moved into position by the Hooka mini tracked crawler crane prior to lift with beam lifter attachment for safe installation of heavy beam.